Loaded with historic VIDEO CLIPS of the action that is being talked about at the time. Reminiscences by Ivan Dunbar – as he said… “A Tremendous Time”. Grimek, Park, Reeves, Pearl, Arnold and more. The video is loaded with historic VIDEO CLIPS of the action that is being talked about at the time. NABBA is the first and original international bodybuilding association. 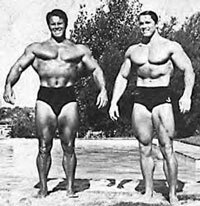 Commencing in 1950, NABBA’s first Mr Universe contest was won by Steve Reeves (pictured left) who defeated Reg Park. Names such as John Grimek, Clarence Ross, Arnold Schwarzenegger, Chet Yorton, Dave Draper, Charles Clairmonte (four-times winner pictured lower right), Bill Pearl, Frank Zane, John Citrone, John Terilli, Lance Dreher, Ed Kawak, Eddy Ellwood and many more. *SPECIAL NOTE RE UNAVAILABILITY OF EARLY UNIVERSE FOOTAGE. As it was not permitted by Oscar Heidenstam to shoot film of the contest in the early years prior to 1970, no Universe film record exists of great champions such as Grimek, Reeves, Mickey Hargitay, Earl Maynard, Enrico Thomas, Bruce Randall, Ray Routledge, Joe Abbenda, Bruce Randall and many more. In 1970 Wayne broke the mould so to speak and convinced Oscar that it was a good idea to shoot the contest highlights on film for the sake of posterity, and for recording the NABBA Universe history for future generations. He has done this recording on film and video ever since. Read more on how the Universe filming started by clicking here. In this DVD set, we have used some old film clips of champions such as Grimek, Reeves, Park and others from various contests in USA to show how these stars looked at the time they won the Universe. We are fortunate to even have some footage of Arnold shot from the NABBA Universe audience in the 60s! Where possible or where photos were available to us, we have tried to show images of as many of the Universe champions as possible. The first UK run Mr Universe contest was held on Friday, August 13th, 1948 at the Scala Theatre. The first NABBA Universe was held at the Scala Theatre in London at 7PM on June 24th, 1950. This DVD set is dedicated to the memory of Ivan Dunbar. Without his oral history, help and support, this DVD set probably would not have existed. The NABBA Council is also thanked (see list below) for keeping the tradition going and making the NABBA Universe the longest running and most famous amateur and professional contest in the world. SPECIAL NOTE: Our first video was originally released as “History of the NABBA Universe: 1948 to the Present – The first 50 years”. Reminiscences by Ivan Dunbar, NABBA Chairman as at the time of release of this video and approved by the NABBA Council. John Citrone pictured left with Arnold at the 1966 NABBA Universe. For a Complete list of NABBA Universe winners in all classes from 1948 to the present day, please click here. Complete list of Australian winners at the NABBA Universe, both Men & Women. Malcolm Whyatt’s Tribute to IVAN DUNBAR. My sincere thanks to all of the members of the NABBA Council over the last 40 years who have afforded me the honour and privilege to capture on film and now video the Universe contest, every year since 1970. Wayne Gallasch, GMV Productions. See http://www.nabba.co.uk/ for all your NABBA UK contest information. This DVD is also a tribute to the many NABBA Council members who have organised and worked so hard over the last 60 years to help produce this fantastic contest every year. I wanted to thank you for your efforts, your passion and perseverance, energy and determination in recording the NABBA Universe for 40 years and then for sharing this history with all of us to enjoy on DVD. You have been a living witness to some of the greatest bodybuilders in history from Grimek, Pearl, Park and Reeves to Arnold, Zane and Chet Yorton to the modern era with guys such as Charles Clairmonte, Eddy Ellwood, John Citrone etc up to Martin Kasal in 2009. You are the man who is our link to the past in recording and storing history for future generations. Please keep up the good work at the UK Universe for many more years.